Horse racing and betting go together like peanut butter and jam. If you watch a horse race it’s just natural to want to have some action on the race. Betting on the races is a crucial part of horse racing culture and it adds a ton of excitement to the experience. This page will give you all of the information you need to start betting on horse races online from here in Canada. I’ve outlined our three recommended sportsbooks for Canadians (each of which has an easy to use racebook section) and also provided a detailed explanation of the most common bets you can make on a horse race. Further down the page you will find a step by step guide to quickly and easily get your horse racing wagers placed online and directly at the bottom you can find our recent articles outlining odds and picks for big upcoming races. These are our three recommended sportsbooks for Canadians. Both Sports Interaction and Bodog have a dedicated racebook section at their site, while Bet365 includes the horse race betting odds directly in their sportsbook under the ‘Horse Racing’ header. 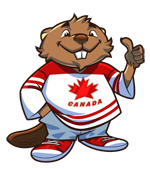 Each of these sportsbooks is focused on providing a great service to Canadians and this shows through in their bet offerings, deposit/withdrawal methods and customer service. Click any of the reviews above to learn more about each sportsbook. Pro Tip: Look at the horse racing rules for any sportsbook you wager at. The bet and payout limits will vary depending on what track you are betting on. There’s nothing worse than hitting a huge long shot and then realizing you are only eligible to receive half of your winnings. When betting on a horse race you should first know whether the odds are fixed or the odds are using the parimutuel betting system. In general if you bet on the race in the sportsbook the odds will be fixed, but if you place your wager on race day in the racebook then the odds will use the parimutuel system. With parimutuel betting the odds can change up until the race. This is because all of the wagers on each horse are placed into a pool and the payout odds are then calculated based on the amount of money wagered on each horse. Win, Place and Show are the common bets that you can make on a horse to win or finish in the top 3 of a race. A win bet requires the horse to finish in 1st place. A place bet requires the horse to finish in 1st or 2nd place. A show bet requires the horse to finish in the top 3. The payout will obviously be more if you bet on a horse to win the race, than if you bet the horse to place or show. Here’s a screenshot from the SportsInteraction.com racebook showing how you would bet on Win, Place or Show. Exotic bets generally involve betting on more than one horse on the same ticket and everything has to correctly hit for the ticket to pay out. Exotic bets are similar to parlay bets in sports. An exacta bet is an example of an exotic wager. 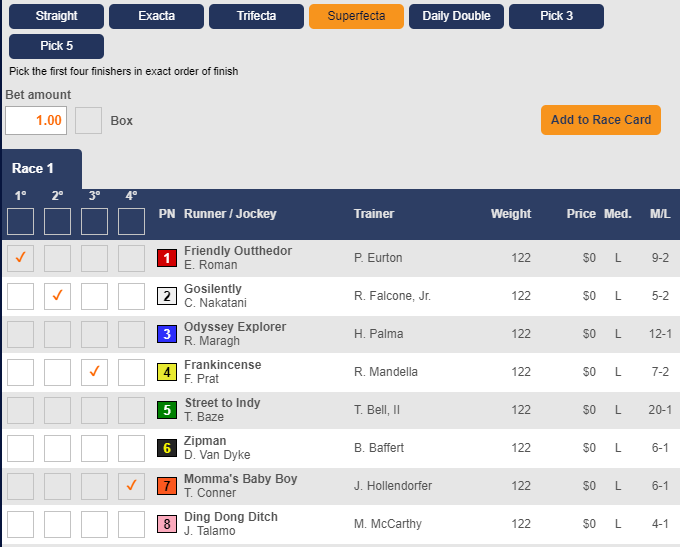 With an exacta bet you pick a horse to finish first and another horse to finish second. Both horses must finish in their selected position for the exacta bet to pay out. The most elaborate exotic bet, and one that can really change lives with a huge payout is the superfecta bet. With a superfecta you select which horses will finish in 1st, 2nd, 3rd and 4th in that order. It’s not unheard of for superfecta bets of just $1 to pay out north of $50,000 at major races. Here’s an example of what a Superfecta bet would look like on a race at SIA. Pro Tip: Only bet the minimum for exotic wagers. This is especially true for the very difficult to hit exotics like the superfecta. There’s no point in betting more than $1 on a superfecta because there is likely nobody (or very few others) betting the exact same superfecta, so raising your bet only lowers your bets value. First you will need to open an account with one of the sportsbooks I recommended above. For this guide I will be using Sports Interaction, which is the site I used for the screenshots above. Sports Interaction is our top rated betting site for Canadians and this includes horse racing because they have a state of the art, easy to use racebook that takes bets on all of the big tracks from around the world. Click here to visit SportsInteraction.com. Then click on the green ‘Bet Now’ button and complete the registration form to open your account. Next you’ll need to fund your account. Sports Interaction accepts Visa, MasterCard, iDebit, Instant Banking and several other deposit methods. You can see all of the current deposit methods on our Sports Interaction review. It is very easy for Canadians to get money into and out of their Sports Interaction accounts. By joining through our link you are entitled to an exclusive sign up bonus equal to your first deposit, up to $200. The bonus is easy to clear so I suggest taking full advantage of it. You are now ready to place your bets! 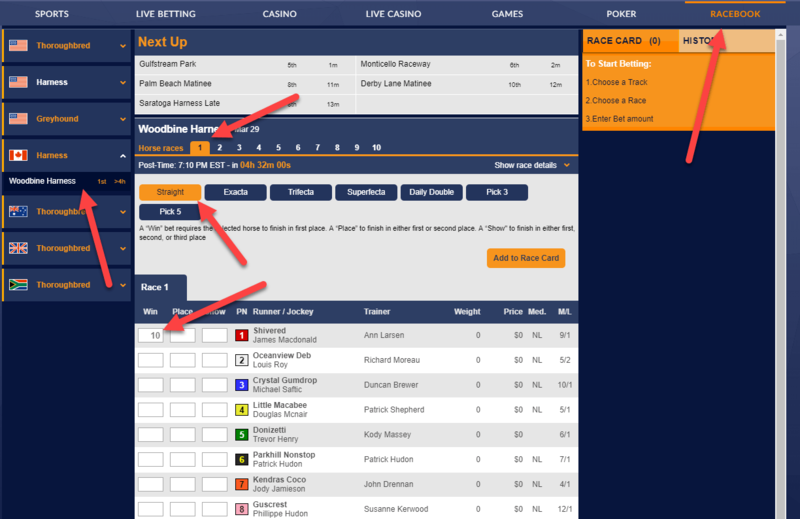 Once at the Sports Interaction website you should select ‘Racebook’ on the far right side of the top navigation bar. 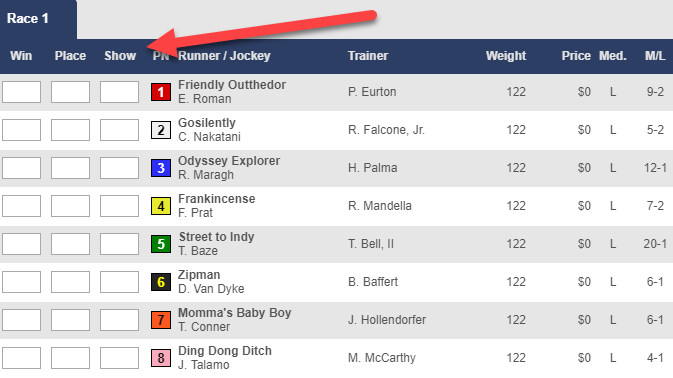 Once on the racebook page you can find the track you want to bet on in the left sidebar. After that you can select the race you would like to bet on and the type of wager you want to make. Then place your bet. Ready to bet? Click here to visit SportsInteraction.com.